These tribal areas would be allowed to keep their autonomy to an extent as long as they recognise the Free Republic as their sovereign overlord. We anticipate many tribes will accede to the terms while the more aggressive ones will not. The joint military mission would eliminate the threat these aggressive tribes pose. As to the name of the Katonid Khanate, we agree completely and welcome suggestions to rename that region. Ok. Well, Vanuku would obviously help restore law and order in the western tribal areas along the lines of Foreign minister Fik's suggestion if the FRJ requires that assistance. In terms of the nuclear site and surrounding area, we presume the FRJ would take sole control of this area for security purposes even though it is actually overlaps the border of the Western Tribal area and the Katonid Khanate (or whatever it will be known as going forward)? We propose the name of the Southern Khanate for the current Katonid Territory. The blast zone will also be placed under direct FRJ jurisdiction until it is cleaned up. With all that cleared up, I think our summit is coming to a close and we will wait for final statements before concluding. Deltaria accepts FRJ jurisidiction over the nuclear blast zone and surrounding areas. We will begin organising for the final operation to restore order in the Tribal Areas. We will also present a reconstruction aid package for Jelbania. This has been a very productive process and Deltaria thanks all its co-participants for their industriousness and open-minded approach. 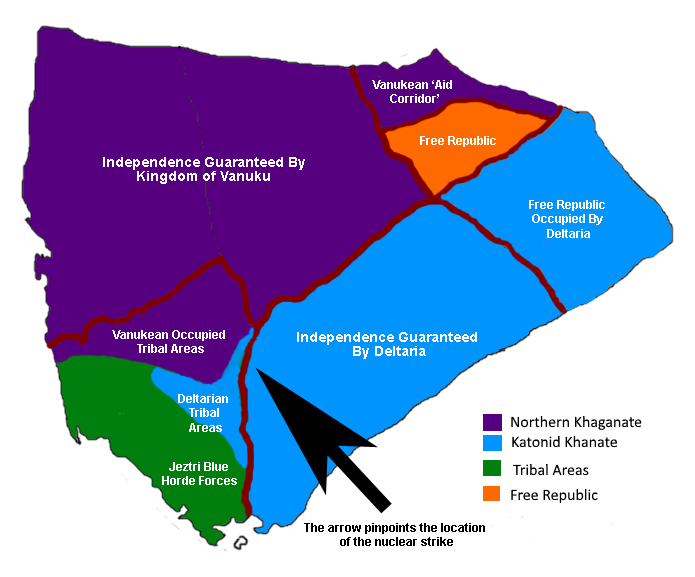 The reason this conflict began so many years ago was the recognition of the Katonid Khanate as a sovereign state - giving that entity a legitimacy and emboldening it to consider expansion into other parts of a weak and fragmented Jelbania. Unfortunately, rather than address this concern, there were some in the world community who used the situation to meet their own needs and tried to use it to drive a wedge between Majatran nations and create instability while paying lip service to peace. In the short and possibly mid term they succeeded; however, not in the long terms as this summit suggests. From our point of view the establishment of a confederal state, considered sovereign to the Free Republic, addresses our long standing concern. The fact that Vanuku will still have economic influence over the Northern Khaganate and Deltaria has similar influence in the Southern Khanate allows us both to play a major role in the rebuilding of a unified Jelbania and to consider exciting future projects. Therefore, it is our intention to accept this proposal and we look towards good relations with the new Jelbanian nation. We will continue to withdraw our troops from the north in conjunction with a Deltarian withdrawal in the south, following the five-year timeframe outlined by Foreign Minister Fik. Vanuku continues to pledge significant financial and humanitarian support for the clean up work required at the site of the nuclear strike and will do our upmost to work with the new government to pacify the Western tribal areas, so this area quickly falls under its governance. We thank all delegates present at this summit for their co-operative manner and we hope to use this to forge a meaningful relationship with all present for the betterment of not only our nations but Majatra as a whole.